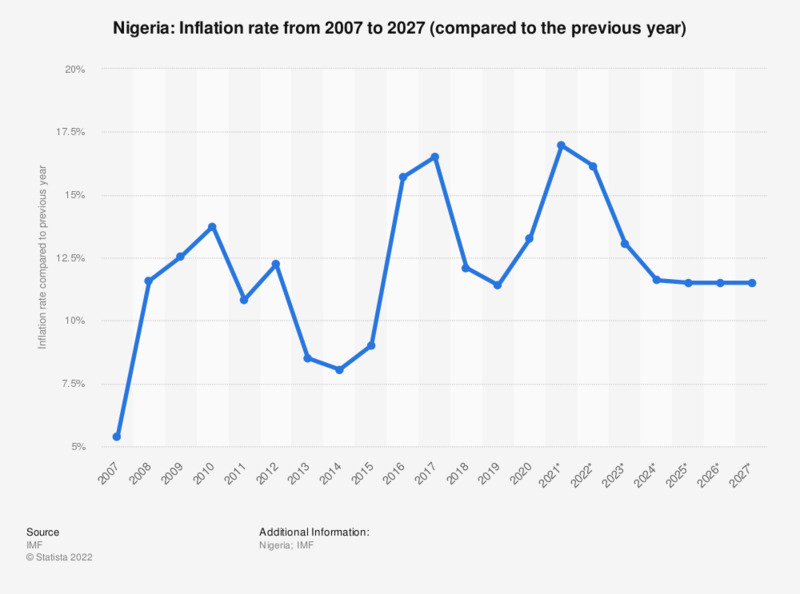 Nigeria’s inflation has been higher than the average for African and Sub-Saharan countries for years now, and even exceeded 16 percent in 2017 – and a real, significant decrease is nowhere in sight. The bigger problem is its unsteadiness, however: An inflation rate that is bouncing all over the place, like this one, is usually a sign of a struggling economy, causing prices to fluctuate, and unemployment and poverty to increase. Nigeria’s economy - a so-called “mixed economy”, which means the market economy is at least in part regulated by the state – is not entirely in bad shape, though. More than half of its GDP is generated by the services sector, namely telecommunications and finances, and the country derives a significant share of its state revenues from oil. To simplify: When the inflation rate rises, so do prices, and consequently banks raise their interest rates as well to cope and maintain their profit margin. Higher interest rates often cause unemployment to rise. In certain scenarios, rising prices can also mean more panicky spending and consumption among end users, causing debt and poverty. The extreme version of this is called hyperinflation: A rapid increase of prices that is out of control and leads to bankruptcies en masse, devaluation of money and subsequently a currency reform, among other things. But does that mean that low inflation is better? Maybe, but only to a certain degree; the ECB, for example, aspires to maintain an inflation rate of about two percent so as to keep the economy stable. As soon as we reach deflation territory, however, things are starting to look grim again. The best course is a stable inflation rate, to avoid uncertainty and rash actions. Nigeria is one of the countries with the largest populations worldwide and also the largest economy in Africa, with its economy growing rapidly after a slump in the aforementioned year 2017. It is slated to be one of the countries with the highest economic growth over the next few decades. Demographic key indicators, like infant mortality rate, fertility rate, and the median age of the population, all point towards a bright future. Additionally, the country seems to make big leaps forward in manufacturing and technological developments, and boasts huge natural resources, including natural gas. All in all, Nigeria and its inflation seem to be on the upswing – or on the path to stabilization, as it were.